Linda named her new charge Mango. She soon discovered that the new family member had some chronic health problems, particularly constipation. “She had to get enemas once or twice a month,” she said. Linda came to Southern California to go to school in June, 2014, with Mango in tow on the airplane. (Her other cat had died.) She enrolled at Pierce College in Winnetka, intending to become a veterinary technician because of her love of animals. But she ran into some trouble with a chemistry course and decided to change her major to computer science. She did well – all A’s and one B –but decided to enroll at California Institute of the Arts to pursue her first love, music. She will complete course work this spring on a master of fine arts degree. Earlier, she had earned a bachelor’s degree of music in jazz studies from Vancouver Island University in British Columbia. In November of 2015, Mango’s chronic constipation became a very real problem. “She would poop everywhere – on my bed, on the floor,” Linda said. “Sometimes, she’d try to poop and she couldn’t, so she’d cry. She was losing weight. 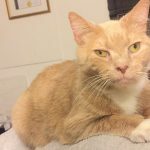 She was extremely bloated because her colon was impacted.” Linda had little money to spend but she took Mango to Happy Pets Veterinary Center in Valencia. 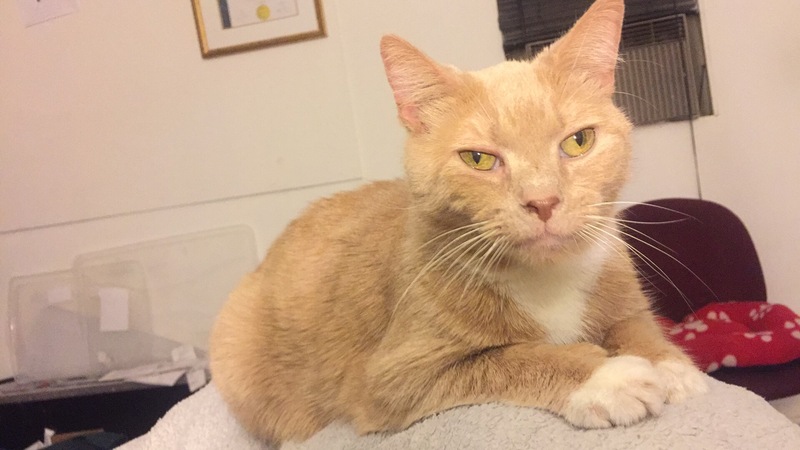 Dr. Kelly put Mango on intravenous fluids, multiple enemas, laxatives and pain medication for three days to stabilize her condition and suggested that Linda apply to Angel Fund for help. She did and received a grant of $275, a sum matched by Happy Pets. But Mango still needed surgery. “I found myself looking on the ground for coins, when I walked on campus,” Linda said. “It only cost $1.20 to get rice and beans at my school, so that’s what I was eating.” Dr. Kelly suggested going to a low-cost clinic. Jane Horsfield and Dan Balza of Fountain Valley, California, adopted their dog Kiss at six-months-old when her previous owner no longer had time to train her for flyball. Through the years, Kiss’ super energetic nature has made her a perfect participant in flyball, agility, and nose work competitions as well as in recreational dock diving and K9 Disc. Named after the rock band Kiss because of her black and white face, her outgoing nature also made her an ideal candidate for pet therapy work. As part of the Animal Health Foundation, an affiliate of Pet Partners, Horsfield and Kiss started visiting adults and children at local hospitals as well as elementary schools where children practiced their reading skills with Kiss sitting by their sides. As a “rock star” therapy dog, Kiss also gets invited to special events around town to raise awareness and money for skin cancer awareness through the local Rotary Club. It was during an event that Jane noticed some swelling above Kiss’s front left paw. But a week later, Kiss’ lower front left leg still looked swollen. Her veterinarian, Dr. Wayne Kopit of Brook-Ellis Pet Hospital, biopsied the lump and called Horsfield the day after Thanksgiving with the results. 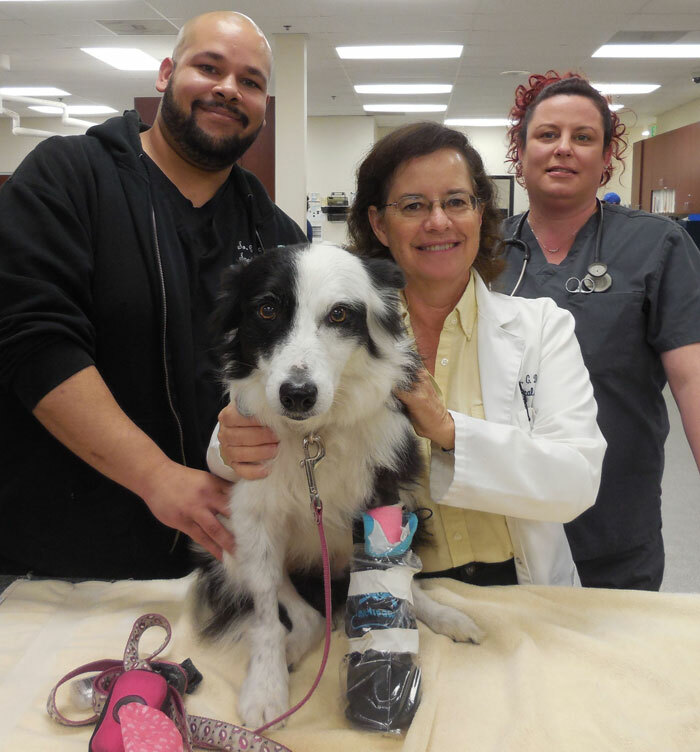 Kiss had a soft tissue sarcoma on her leg. He decided to refer Kiss to Southern California Veterinary Specialty in Irvine, California for the cancer treatment. That’s because the previous Thanksgiving, the couple also had received cancer news about their dog Sheila. She died seven months later despite extensive surgeries and treatments to save her life. Unfortunately, the heartbreak doesn’t end there. The couple has lost four dogs to cancer through the years. 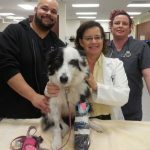 When Horsfield contacted the Animal Health Foundation to let them know about Kiss’ diagnosis, they told her that Pet Partners had grant monies from the Petco Foundation’s Pet Cancer Awareness campaign to help therapy dogs with their cancer treatments. A $3,000 grant provided help with Kiss’ surgery and chemotherapy. “We had already spent thousands on Sheila’s treatments, so we really needed this support to help Kiss,” says Horsfield. In the past, doctors might have amputated Kiss’ leg because of the difficulty in removing the entire tumor. But a new therapy combined surgical removal of the tumor with chemotherapy beads implanted directly into the tumor site. “The beads dissolve over four to five weeks releasing chemotherapy drugs to where it’s needed most,” says Horsfield. So far, the results are good. The tumor hasn’t grown back, but Horsfield checks the leg daily, since if it returns, it will come back in the same spot, doctors say. She and Kiss are making therapy visits again, and Kiss is participating in some of her favorite sport activities on a limited basis.